Disclosure: This post contains Amazon affiliates. To read more about this, see my disclosure policy. 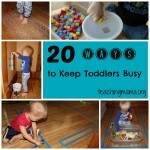 It’s pretty clear to me that many moms out there are seeking toddler activities to keep their little ones busy. 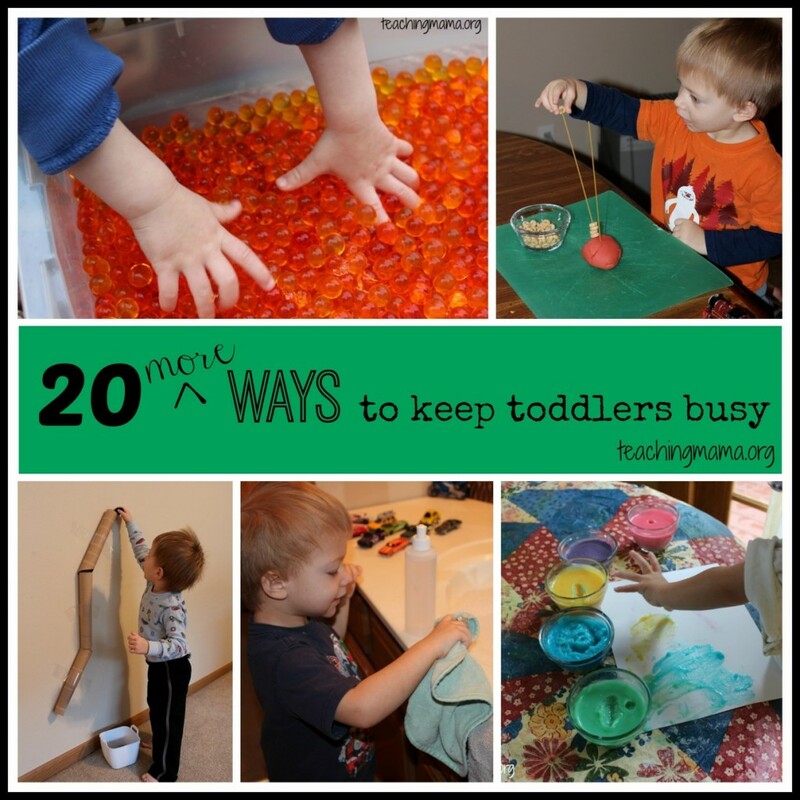 My post on 20 Ways to Keep Toddlers Busy has been my all-time, most viewed and pinned post, so I decided I would add to the list and write 20 MORE ways to keep toddlers busy!! 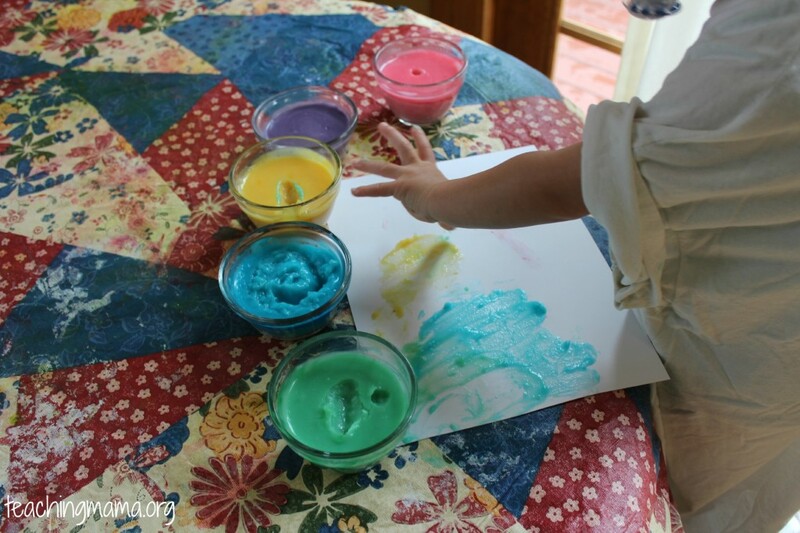 My other post focused on toddler activities that they could do independently. This list is a little different because some of these are activities are designed for parents to do with your toddler to keep them busy. Hope these ideas will be helpful to you! 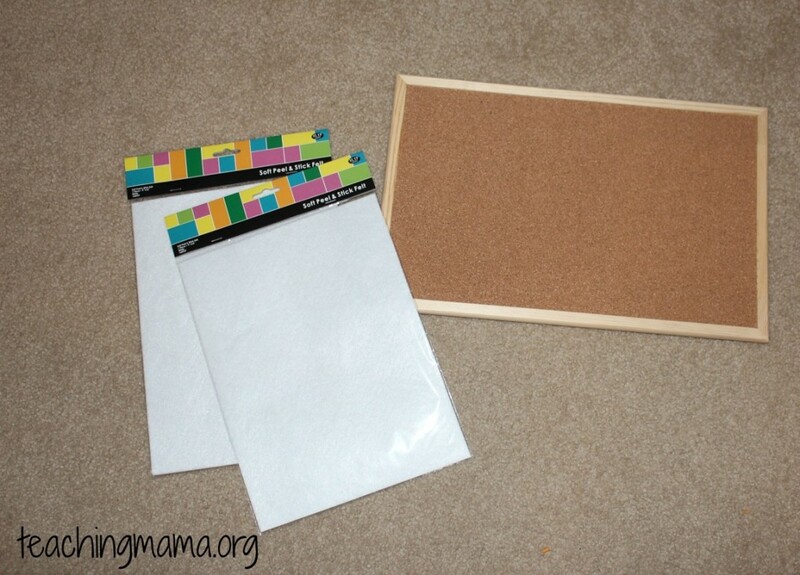 To start off, I made a felt board simply by just putting felt onto a bulletin board (I used sticky felt ) . Little Mouse, Little Mouse, Are you hiding behind the ________ (say a color) house? Then you see if they are right. It is a great activity for practicing colors. 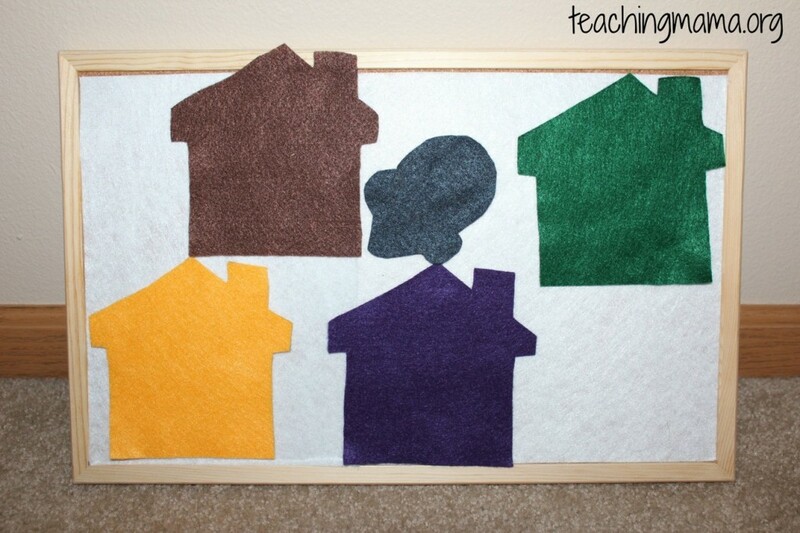 To see all our felt activities (and get the templates), click here. This activity is SO fun! 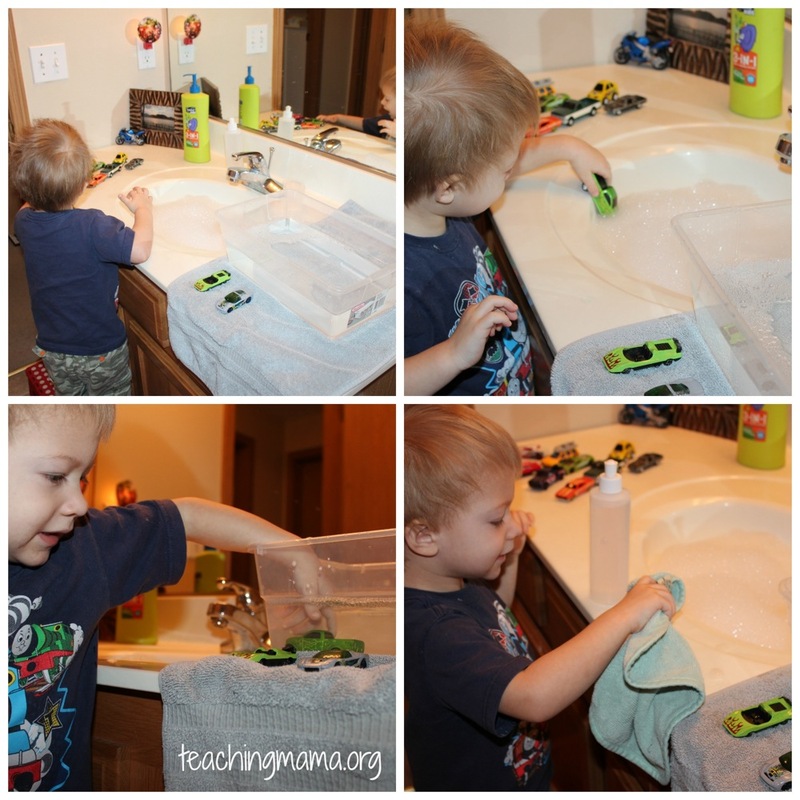 We took our toy cars and got them cleaned with our car wash! I set the toy cars up by the sink. Then I filled the sink with soapy water. We also had a bucket of water on the other side to rise the cars off. Lastly, we dried them with a towel. I loved this activity because my son learned how to follow steps and he also could do this by himself with me just watching. He was so proud of his clean cars! You could also do his with action figures, dolls, little animals, etc. 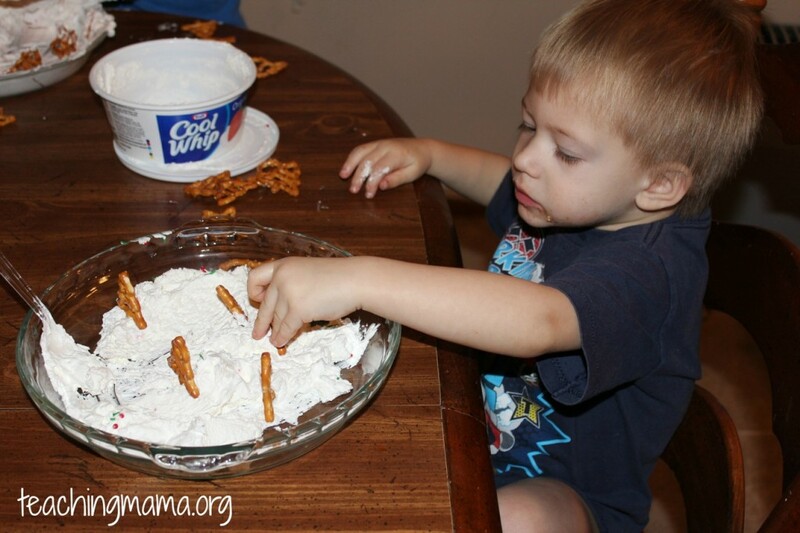 A fun (but messy) sensory activity is letting your child play with shaving cream or whipped cream. The first picture below is my son playing with whipped cream. He is making a forest with pretzel-shaped trees. We have also played with shaving cream. 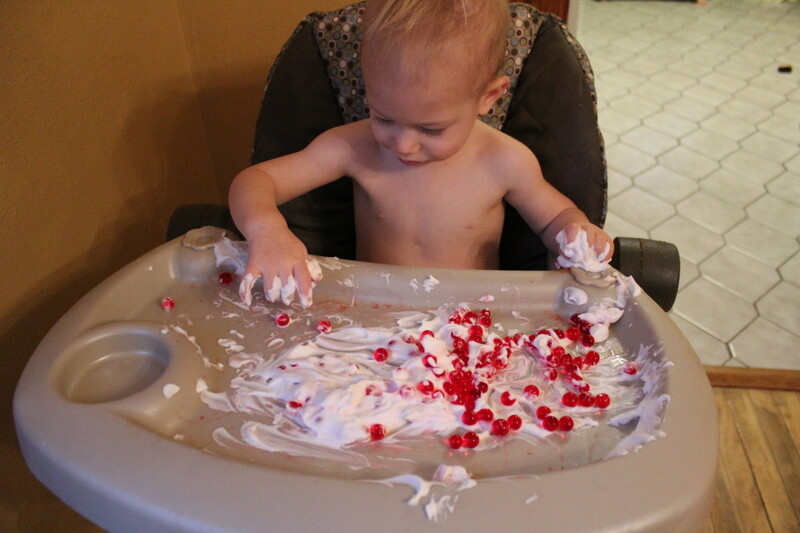 The picture below shows my son playing with shaving cream and water beads together. If your child puts things in their mouth, then this would not be a good activity for them. 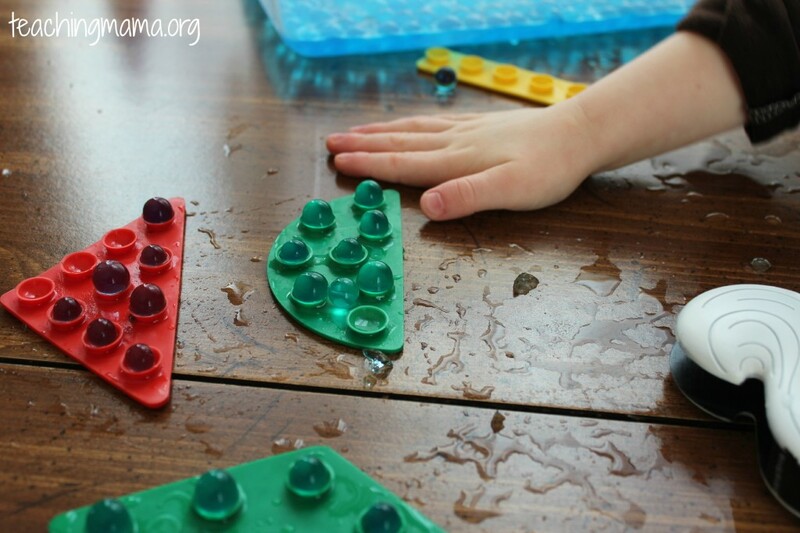 Water beads are so much fun! They are round, squishy balls that come in all sorts of colors. You can find water beads at the Dollar Store in the floral section or here on Amazon. They are actually used as fillers in floral arrangements. 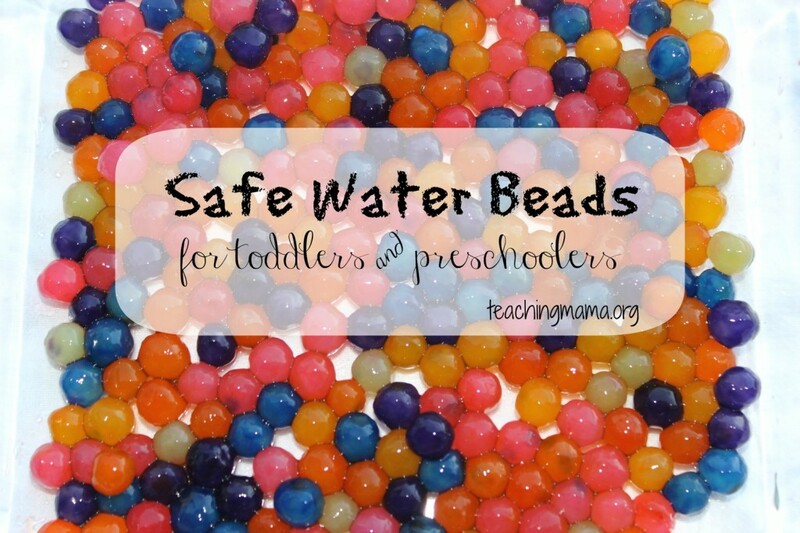 Since water beads are not edible, you may feel unsafe about letting your little one play with them. Especially if they put things in their mouths! 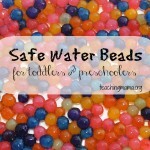 An alternative would be these safe water beads, made from tapioca pearls. You can read how I made them in this post. Create a button snake to help your little one work on their fine motor skills. It’s a great quiet activity, too! To make this, you need a piece of ribbon, two buttons, squares of felt, and needle & thread. Start by sewing a button on each end of the ribbon. Then cut out squares of felt and cut a slit in the middle. Then test it out with your toddler! Have them poke the button through the holes in the felt. It may take some time to get the hang of it. 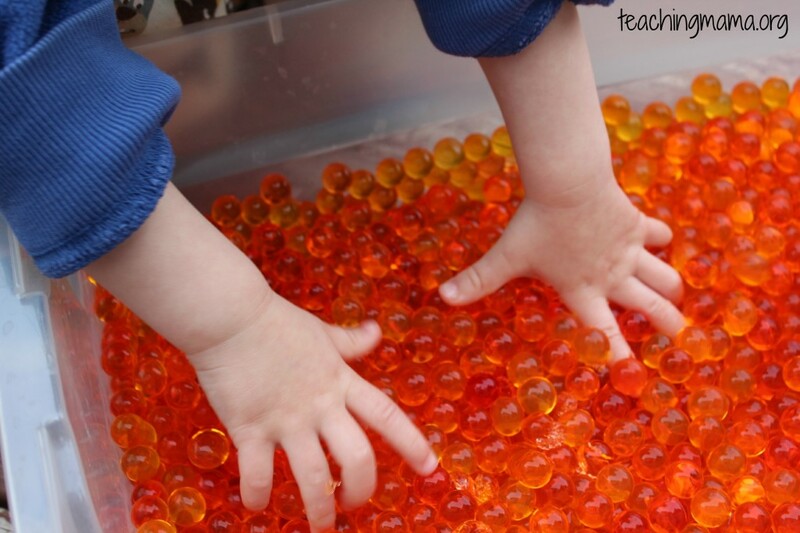 This is great for fine motor skills! 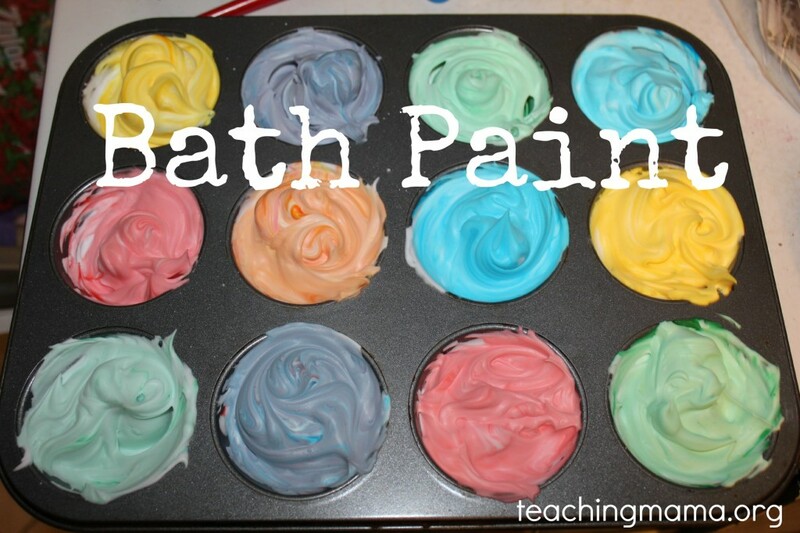 In the winter, we play with bath paint several times a week! It’s so easy to make. I squirt shaving cream in a muffin tin and add food coloring to it. Then I let the boys use paint brushes to “paint” their bath tub. They love it! To make this I took an oatmeal container and cut a circle on the top. Then I used large pom poms (found at Hobby Lobby) and had my toddler poke them through the hole. Even though this seems simple, he loved it! We also used this as a counting practice. He loved counting how many pom poms we poked through the hole. 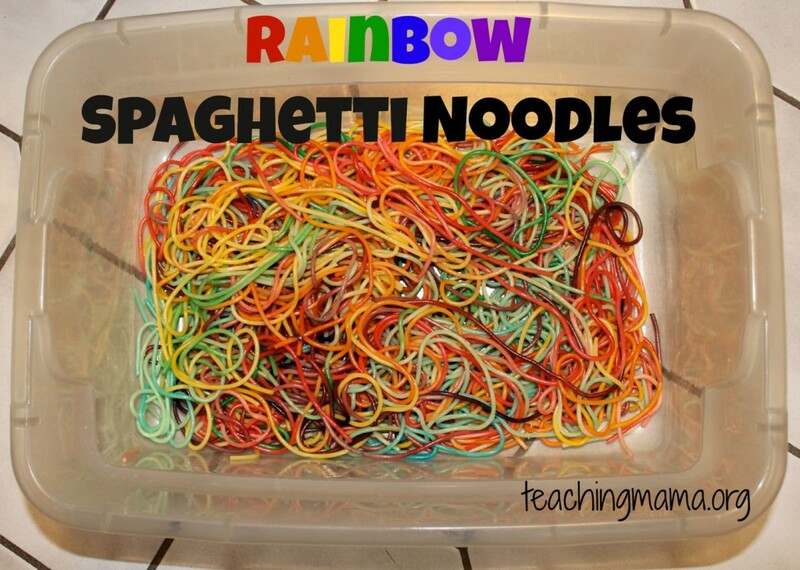 These crazy spaghetti noodles are a super fun sensory activity! To see more on how we did it, visit this post. Sensory sinks are really fun to set up. It’s similar to the car wash, but they have a theme. This one is a pond. 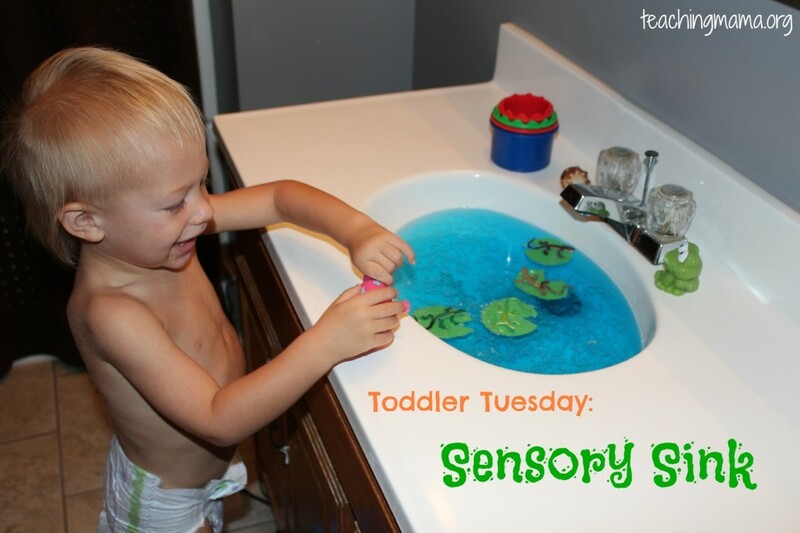 To see more on our sensory sink, click here. My kids love this activity. Just take some play dough, roll it in a ball, then stick spaghetti noodles on the top. Have your toddler slide cheerios down the noodle. 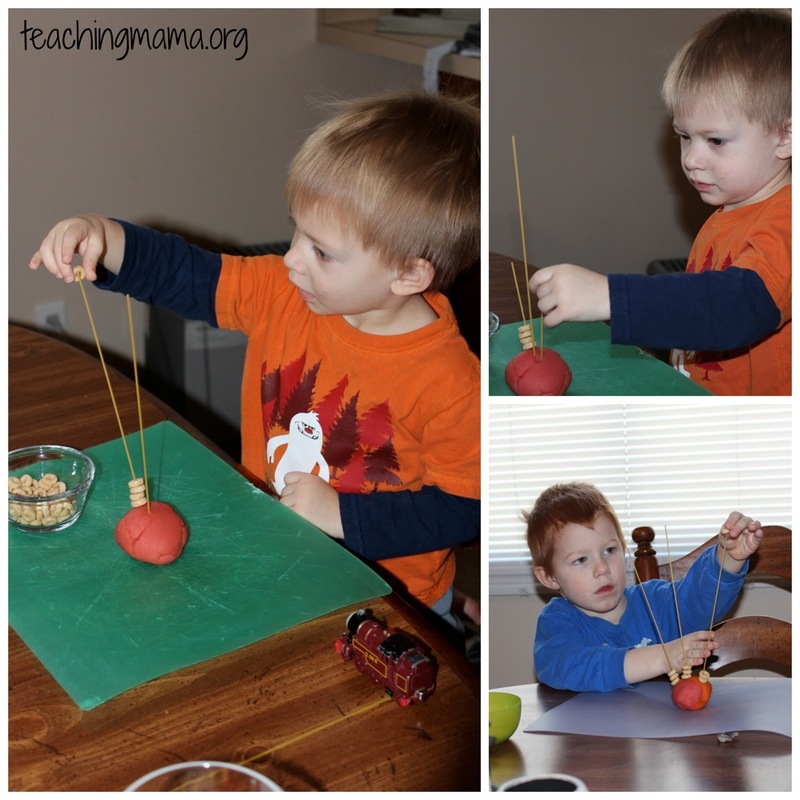 It’s simple, but great for practicing fine motor skills! And it really keeps them busy. 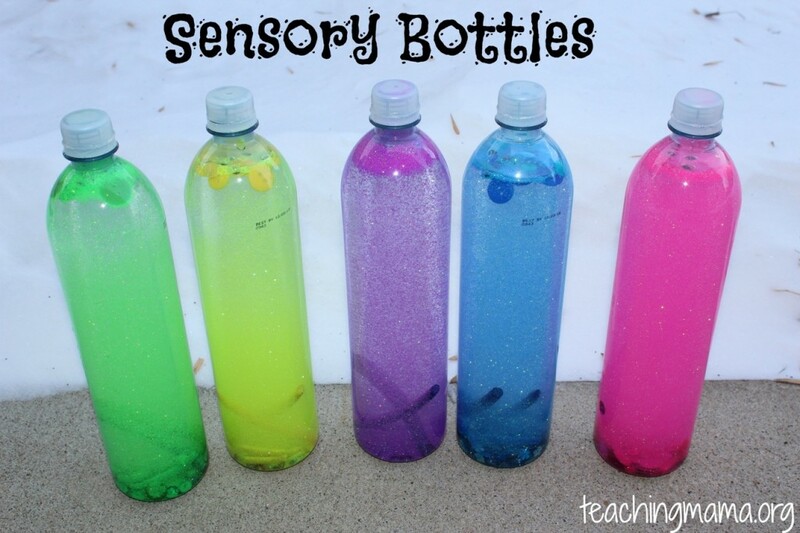 Sensory bottles are beautiful and fun for little ones to shake and explore. To see how we made these, click here. There’s something about melting ice that’s fun for kids. 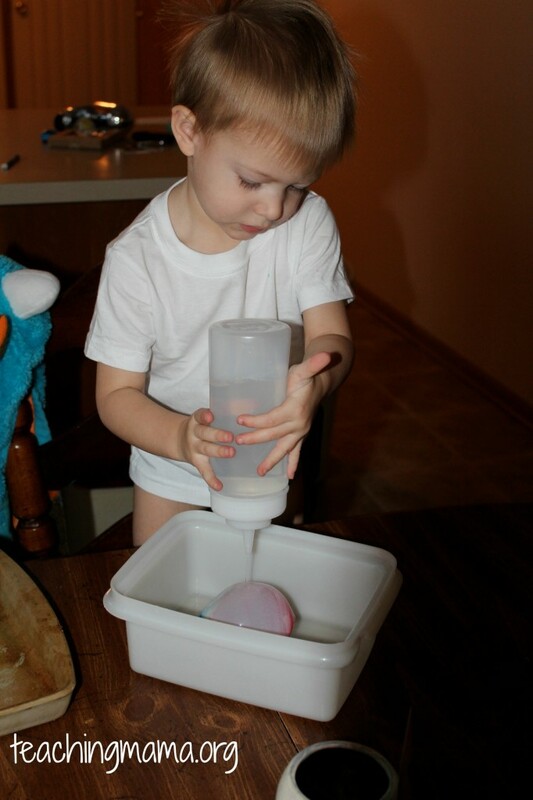 We like to freeze water balloons and then squirt them with warm water in squeeze bottles . It’s also a great science lesson on water and ice. You could also stick little treasures inside the water before freezing them. We did that with a spikey ball in this post. 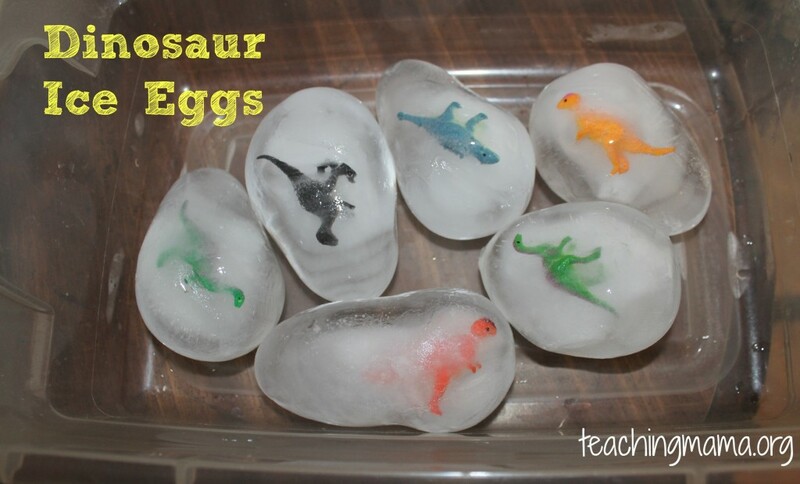 Or you could put little dinosaurs in the water balloons and make them Dino Eggs! You can read how we did that here. 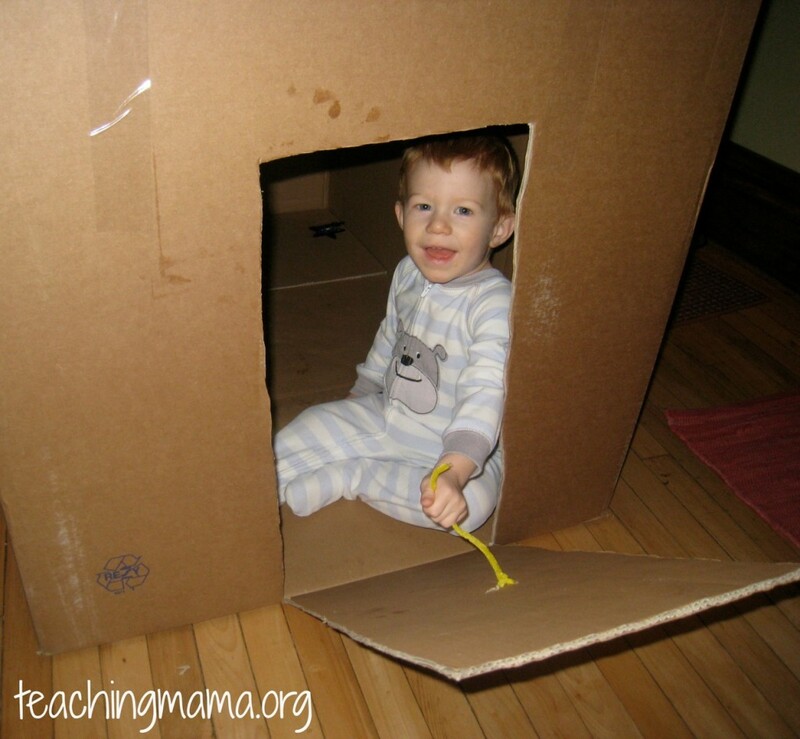 It’s funny how kids love playing with simple things…like cardboard boxes! My husband brought home this huge box from work one day, so we turned it into a little fort. My son played with it for hours! 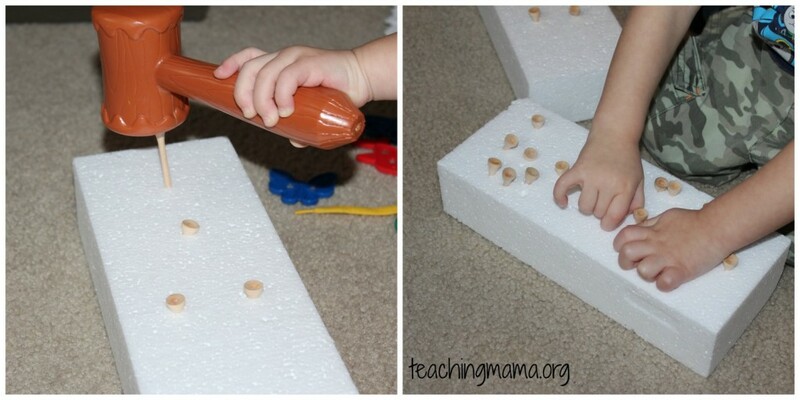 For this activity, I took a block of styrofoam and had my toddler use a toy hammer to poke in golf tees. 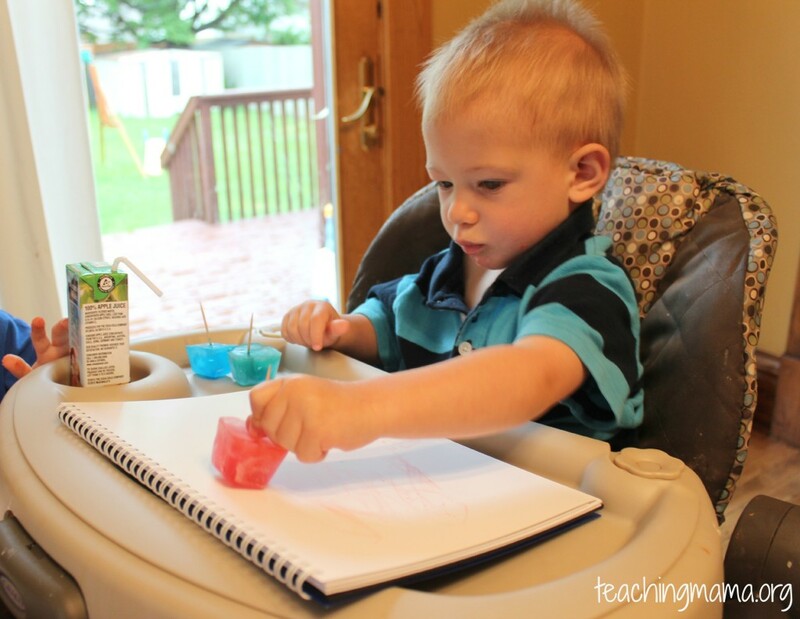 So for this activity, you just fill an ice tray with water and color the water with food coloring. Put them in the freezer and after 20 minutes, stick toothpicks or rounded popscicle sticks into them. Let them freeze until solid. Then you pop them out of the try and have your toddler paint with them. It will look like watercolors on the paper. I know some of you will tell me that toothpicks are sharp and dangerous…and I agree. I should have used popsicle sticks with my toddler. Next time I will! This is probably one of our all-time favorite things to do. You just need flour and oil (I use baby oil) and you can make this! You can find the recipe here. 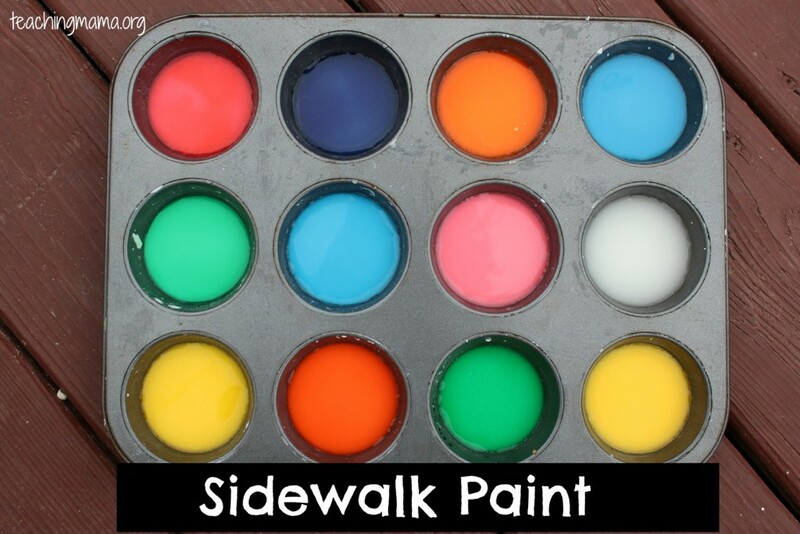 We love coloring the sidewalk with this paint! All you do is mix 1 part water to 1 part cornstarch . Then add in some food coloring. 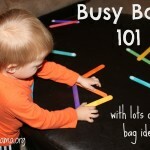 In my other toddler post, I shared the activity of dropping pom poms down a cardboard tube. To spice up the activity, you could add more than one tube. My toddler had so much fun with this variation of the activity. You could try it so many different ways! 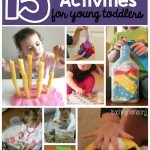 Hope you’ll try some of these activities out with your toddlers! Happy Playing! 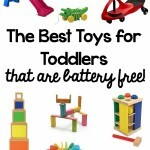 Want more toddler ideas? Check out my book, Play and Learn Toddler Activities. This book is filled with over 200 hands-on activities for toddlers that are fun, easy, and will keep your toddler busy! Click here for more information. 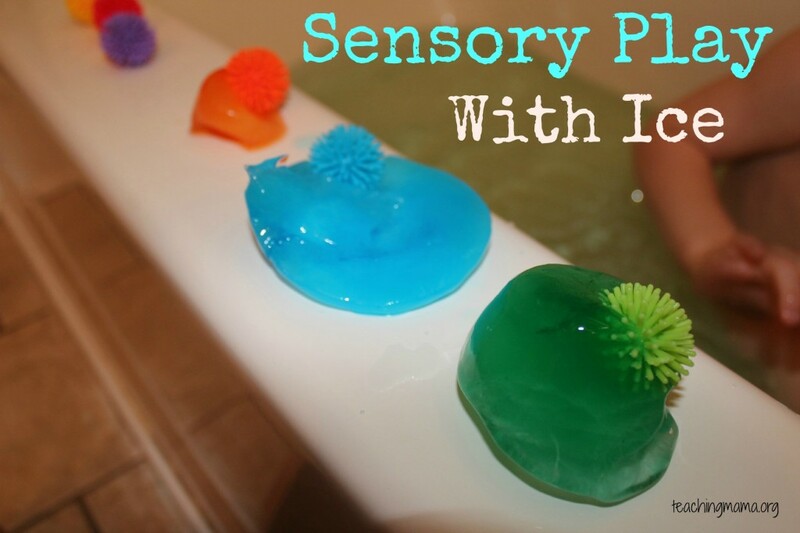 sarah recently posted…A fun new Sensory material! Cute ideas! I’ll keep these in mind for when my son becomes a toddler. Thanks so much for these ideas. They will help on the days that I Ikeep my 3 year old granddaughter. Love the cardboard tube with pom poms! 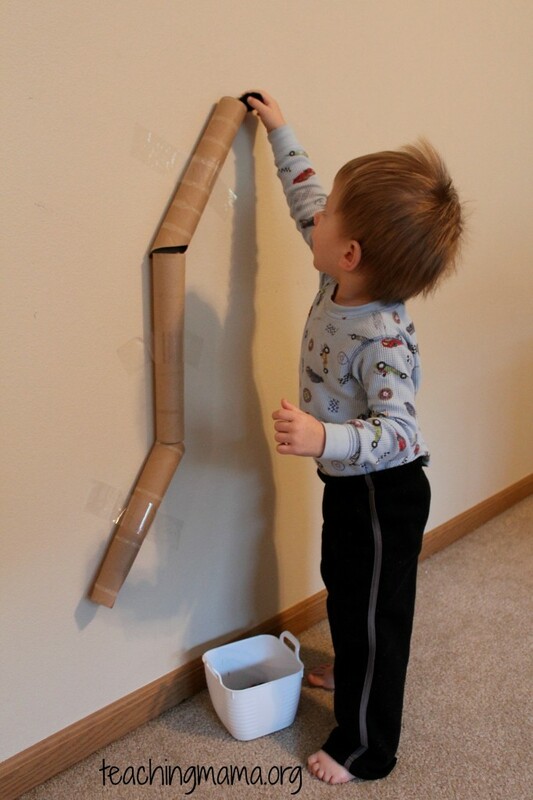 love the tube idea..but I think I will try it with hotwheel cars…think the boys will like that idea. Fantastic ideas all in one place – Thank You!!!! Hey there! 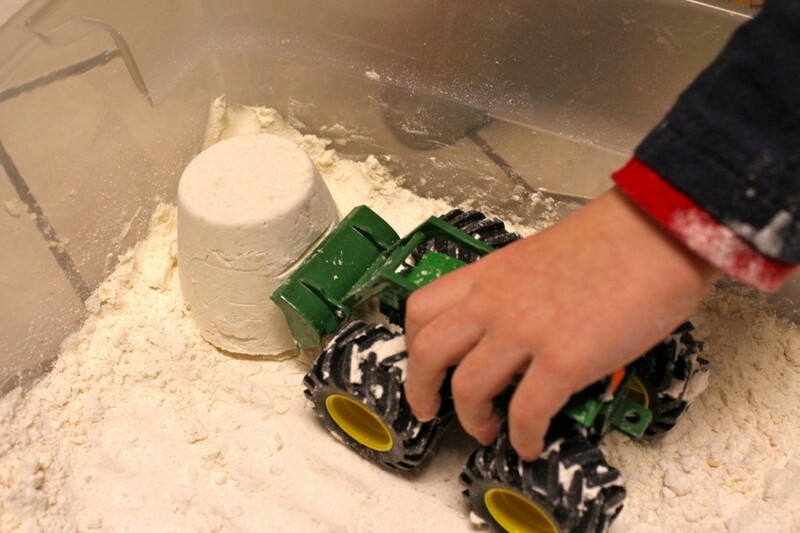 Fantastic ideas and as an ECE I applaud your play based approach to teaching! 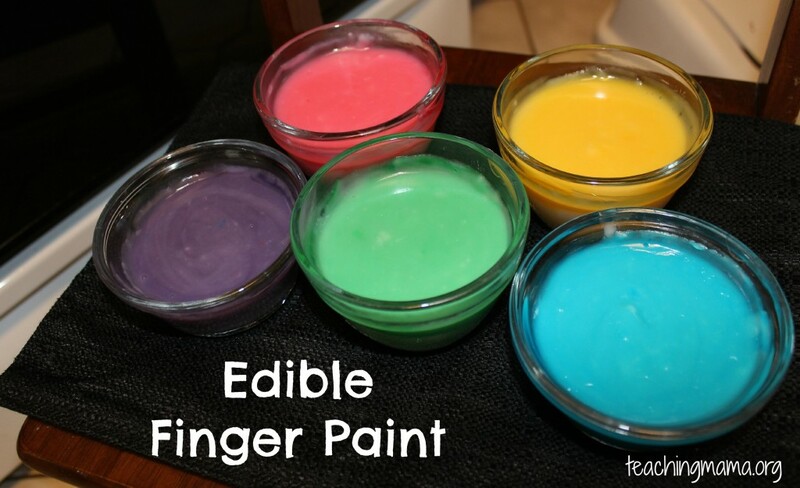 Small tip for you regarding the edible finger paint: if you add in a little bit of cream of tartar (get it in the baking aisle I think it) your paint won’t go mouldy as fast! Thank you so much, Jennifer! I appreciate your tip, too! Will try that next time. So many great ideas that I can’t wait to use!! Thank you so much. My little guy just turned two and we are at the point in the winter when I am looking for new things to do with him. Amazing ideas! Thanks a lot for sharing!!!! I am looking forward to tomorrow even more than before! WOW! I am so impressed. These are all great and creative ideas! As an OTR/L, I must say that there are some great fine motor skills that can be practiced with so many of these activities. Not only will I use them for my own kids, but for my clients as well! Thank you! Very creative and easy to set up. 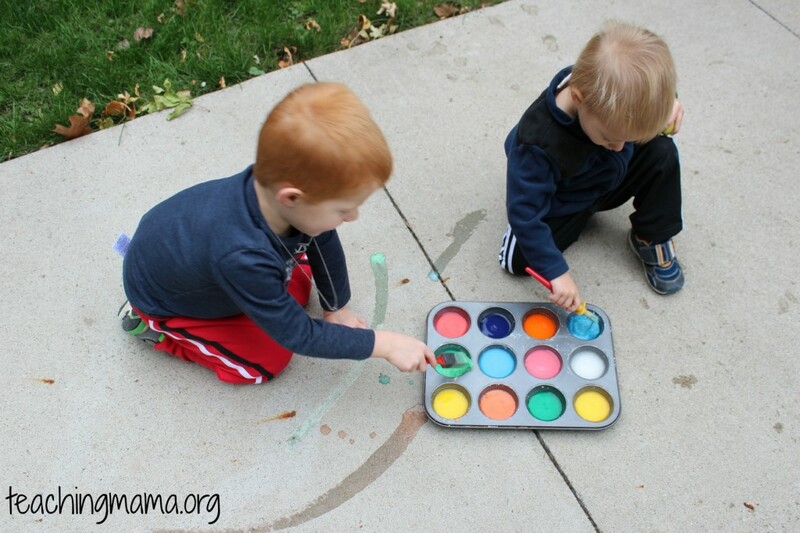 Great ideas to inspire play and. learning. These ideas for kids are awesome. My favourite two are the toy car wash and the bathtub full of toys. I have a similar website with kids ideas being http://www.excitedkids.com but I hadn’t thought of a lot of these. I will add a link to this page as these are really good. Well done! Fantastic! Creative! Great ideas to use for children with a disability. Your ideas are just AMAZING!!!! I’m soooo looking foward to my son being a little older (he is 14 months now) to try them!!! You’re inspiring! Thanks a lot! Thank you so much for these easy, fun ideas! I have stage IV Cancer and not a lot of energy. 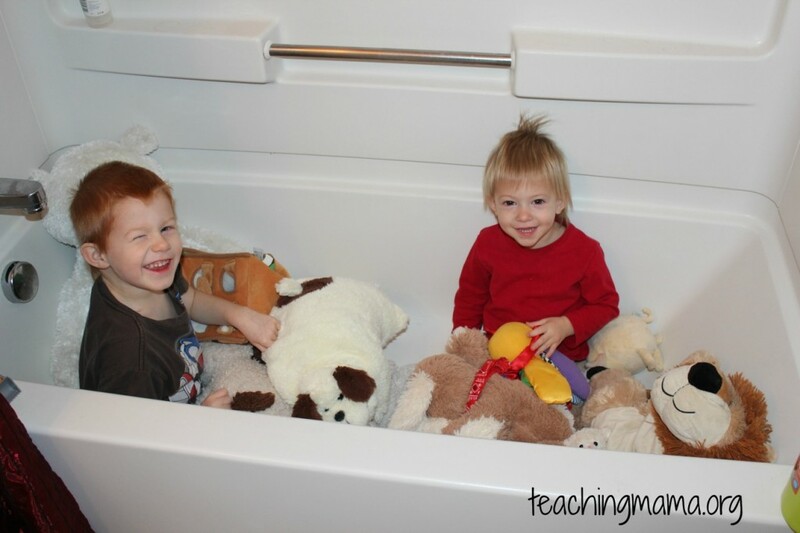 Now I have lots of fun things I can do with my toddler grandkids – so wonderful! Looking for similar mode of ideas for my 8 year old granddaughter. 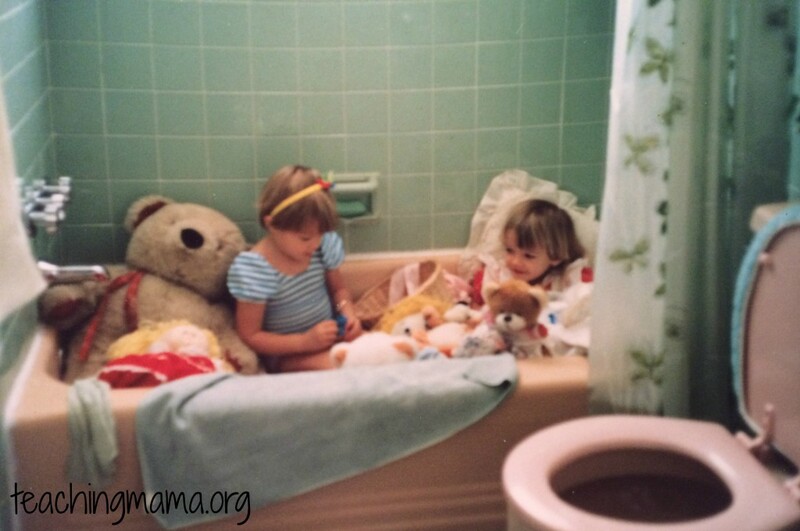 This is also new territory for me as I had 3 brothers and 3 sons – not used to the girls :). Thanks again! Brilliant! Thanks so much for all these amazing ideas. I thought I offered my toddlers variety but had not thought of any of these so can’t wait for them to wake up tomorrow and start giving some a try. 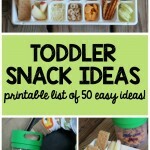 These are some really cute ideas for toddlers. I especially love the “car wash with toy cars”, as I think my boys will like that. I also really liked the “water beads” idea, I’d probably be playing right along with them! Thanks for sharing these ideas.I was looking for some activities for my son as he is into cartoons this week.Thanks! Interestingly great ideas, Some of them are definitely worth a try. I am sure the kids would be loving them. I love that idea for the felt board. I made one recently but used foam core board, hot glue, and duct tape. The duct tape doesn’t really like to stick to felt. My mom gave me my old bulletin boards so I think I’m going to have to use those for our new felt boards. Great idea!!! Anyway, keep up the great work, this is one of our go-to blogs for finding fun activities and the best baby/toddler/kid products for making those activities possible! Wow, lots of activities never thought of.